04 - Natural Selection 04-11 - Divergence of Character 150 After ten thousand generations, species (A) is supposed to have produced three forms, a10, f10, and m10 which, from having diverged in character during the successive generations, will have come to differ largely, but perhaps unequally, from each other and from their common parent. If we suppose the amount of change between each horizontal line in our diagram to be excessively small, these three forms may still be only well-marked varieties; but we have only to suppose the steps in the process of modification to be more numerous or greater in amount, to convert these three forms into well-defined or at least into doubtful species. Thus the diagram illustrates the steps by which the small differences distinguishing varieties are increased into the larger differences distinguishing species. 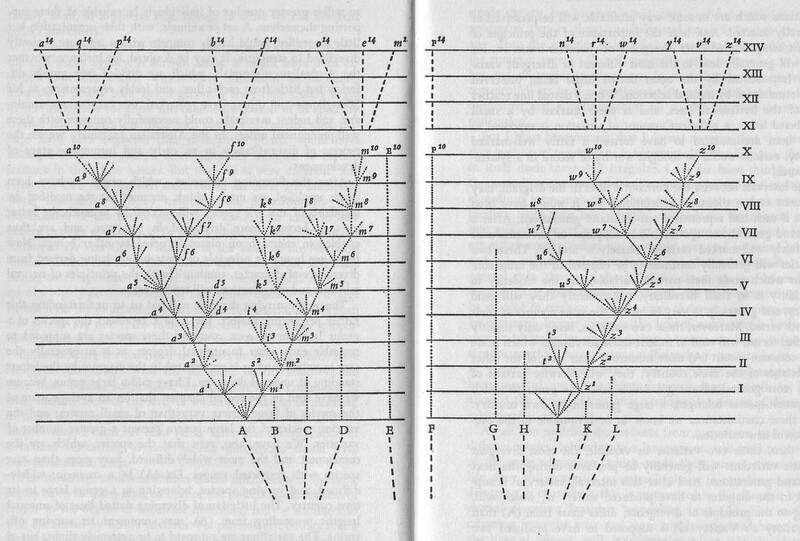 By continuing the same process for a greater number of generations (as shown in the diagram in a condensed and simplified manner), we get eight species, marked by the letters between a14 and m14, all descended from (A). Thus, as I believe, species are multiplied and genera are formed.